Another top performer from Horizon - the Arco only gets BETTER with use. 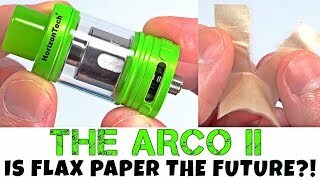 Just like the "Falcon" - the Arco offers up a unique new coil design with a flax paper/cotton combo that gradually improves the flavor output over time with use. This new coil design allows for maximum saturation and lasts longer than the majority of coils in this category. In contrast to the indisputable cloud machine that was the Horizon Falcon, Horizon hasn't forgotten about the vapers on the other side of the spectrum whose only desire is to experience nothing but pure flavor from their e-liquid of choice. And for that, we have the Horizon Arco, a veritable performer of a flavor chasing tank featuring a newly designed chimney built into the 25mm diameter tank. The airflow redesign promises to translate every bit of flavor in your e-liquid into nothing but pure vapor goodness with nothing lost in transition. Now let's take a closer look at the bones of the Horizon Arco and judge for ourselves if it can indeed live up to its promises of being the undisputed flavor champion. Probably one of the most distinguishable characteristics one of the Horizon Arco is its tinted glass tank giving it a smoother and more streamlined look compared to the see-through tanks exposing the barebones design and coil head. The tint does feature a small window in the form of the tanks logo which does a good enough job of letting you know how much e-liquid is actually left inside. But for those who crave full transparency in their tanks, the Horizon Arco does come in a raw stainless steel finish with a clear glass tank. Constructed out of an impossibly hard 304 stainless steel, the Horizon Arco is practically impervious to dents or scratches that might otherwise mar the smooth and virtually flawless finish of the tank. Despite the toughness of the stainless steel used, it doesn't look like Horizon spared any expense in the machining process as everything is impeccably smooth down from the exterior finish to the threadings on the top cap and 510 connection. 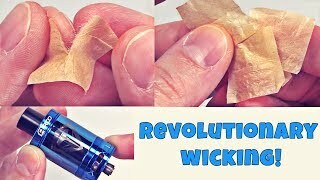 The smooth threads make removing the top cap quick and easy not to mention it also makes screwing down the tank on to your mod feel buttery smooth with any rough burrs for the threads to catch on. The Horizon Arco comes with 2 coil heads straight out of the box. The A4 quad coil rated at 0.2 ohms uses a series of 4 micro coils for just the slightest bit of airflow restriction which yields exceptional dividends when it comes to producing a nice warm and dense vapor that's packed with loads of flavor. The A6 triple coil head is also rated at 0.2 watts but instead produces a much more relaxed vaping experience without much of the warmth that the A4 coil has. That doesn't mean that it's any less flavorful though as the relatively cool vapor helps bring out more of the subtle notes lurking in your preferred e-liquid. The Horizon Arco uses a dual bottom airflow which is the secret sauce behind the exceptional flavor that the tank produces. The bottom airflow design means that there's minimal space for air to travel before it hits the coils and flows up through the chimney, effectively preserving much of that sought-after flavor that many flavor chasers crave. A typical weakness of bottom airflow designs is that they're prone to leaking but through some magic, sorcery, or maybe just good old intelligent design, the Horizon Arco manages to avoid this common downfall that plagues most bottom airflow atomizers.